Organic. For dressings, sauces & marinades. Suitable for coeliacs, vegetarians and vegans. Aspall Organic Red Wine Vinegar is created on the banks of the Ebro River which runs through the Rioja region of Spain. A truly superior Red Wine Vinegar with a clean flavour and a deliciously warm red fruit aroma. Made using natural ingredients; so, as the vinegar matures, a slight sediment or haze may occur. This will not affect the quality of the vinegar. 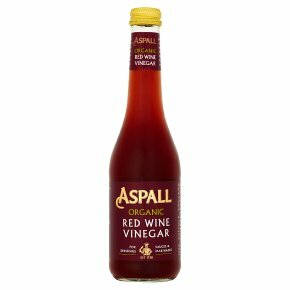 For a delicious vinaigrette, mix Aspall Organic Red Wine Vinegar with olive oil and season with mustard powder and pepper.